BUFFALO, N.Y. -- After closing out their non-conference slate with six straight victories in regulation, the University at Buffalo women's soccer team (6-1-0, 0-0-0 MAC) will open up Mid-American Conference play this weekend with a pair of road matches against MAC West foes. The Bulls will open up the weekend at Northern Illinois on Friday night before wrapping up the weekend at Western Michigan on Sunday afternoon. After falling in their season opener on the road to St. John's, the Bulls haven't trailed in a match since as they have won six straight matches in regulation for the first time since 1999. 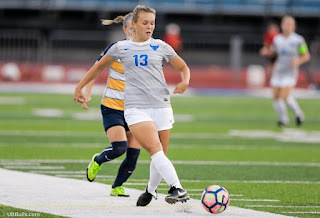 The Bulls are coming off of a 3-1 victory over St. Bonaventure on Friday night in front of their home fans as Carissima Cutrona netted a pair of goals and an assist in the dominant win. The UB offense has put together their best start under head coach Shawn Burke as they have netted 16 goals through seven matches (2.29 goals/game) while averaging 15.0 shots/match. Leading the Bulls charge offensively this season is senior forward Carissima Cutrona who has netted a team-best five goals, seven assists and 17 points, all during her current six-match scoring streak. The Williamsville native leads the MAC in points (17) and ranks second in the NCAA in assists (7) while notching five multi-point matches so far this season. Fellow forward Marcy Barberic has provided the Bulls with another dangerous threat up top this season and she has produced a career-high four goals, three assists and 11 points while taking 21 shots. Sophomore Kaitlyn Walshwas having a strong start to her season before sustaining an injury as she netted a career-best two goals and two assists through four matches. Freshman Andrea Judasz earned her first career start last time out and has provided a nice spark for the Bulls attack as she has notched two assists so far this season. Defensively, the Bulls have been garnering some serious attention as they have earned three straight MAC Defensive Player of the Week honors, two by goalkeeper Emily Kelly and one from defender Tess Ford. As a team, the Bulls have allowed just five goals through seven matches while only allowing two goals in their last 598:40 minutes of game action. Kelly earned the weekly recognition for the second time in her career this week as she owns a 6-1-0 record to go along with a 0.71 goals-against average, a MAC-leading .868 save percentage and four clean sheets. The freshman keeper has been getting some strong play in front of her as junior captain Gurjeena Jandu and freshman Tess Ford are anchoring a back line that has allowed just 10.1 shots/game. Senior Rebecca Bramble, Adrianna VanCuyck and Hannah Callaghan have also made it difficult for opponents this season in the Bulls' defensive third of the pitch. The Northern Illinois Huskies enter Friday's match against the Bulls with a 1-7-0 overall record as they collected their first win of the season against Eastern Illinois, 2-0, just over a week ago. The Huskies are coming off of a 3-1 loss to Northern Iowa last time out as they have struggled to produce goals so far this season. Trudy Quidzinski is leading the Huskies offense with two goals while Abby Gregg has netted one goal, a game-winner, to go along with a team-high 14 shots. In goal, NIU is led by Megan Donnally who owns a 2.14 goals-against average with 65 saves and one clean sheet on the year. After the MAC opener on Friday, the Bulls will travel to Kalamazoo for a meeting with the Western Michigan Broncos who are 6-2-0 overall on the season after earning a 3-2 win over Indiana State last weekend. The Broncos will open up their MAC slate on Friday at home against Akron. The Broncos are being led offensively by Hannah Kahn who has netted three goals, three assists and nine points while Bailey Kohorn leads the squad with four goals, including three game-winners. Grace Labadie leads the team with five assists and 30 shots while Alyssa Burke is having a strong start to the season as she has netted three goals, two assists and eight points. In goal, Hannah Sargent has started all eight matches while owning a 6-2-0 record to go along with a 0.88 goals-against average, a .788 save percentage and tying Kelly with a MAC-high four clean sheets. After this weekend, UB will return home as they host MAC foes Central Michigan and Eastern Michigan on Friday and Sunday, respectively.